Henry was the focal point of attack and Bergkamp had supporting role. This is supported by two evidences. 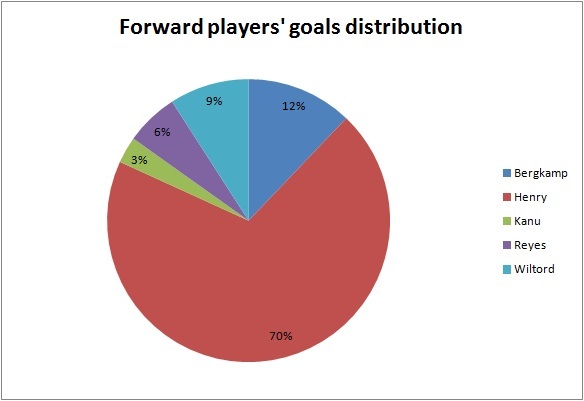 Firstly, Henry scored 70% of forward players’ goal (exclude penalty) as shown in the following chart. However, it must be clarified that Arsenal was not a one-man team. 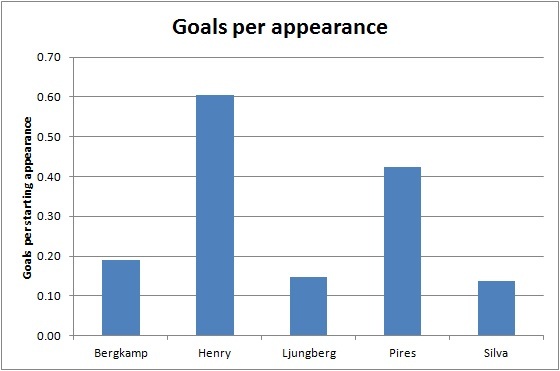 Secondly, in terms of building up goals, Bergkamp was a more efficient player than Henry which I explained last week. On the other hand, they both contributed well in terms of assist. They were in the top 3 players in making assist. This forward partnership was so important in the team because they made 41% of team assists. 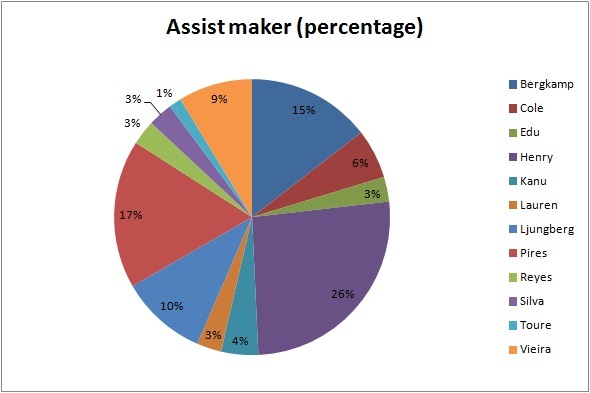 If we consider the efficiency of making assist, their contribution is more obvious. 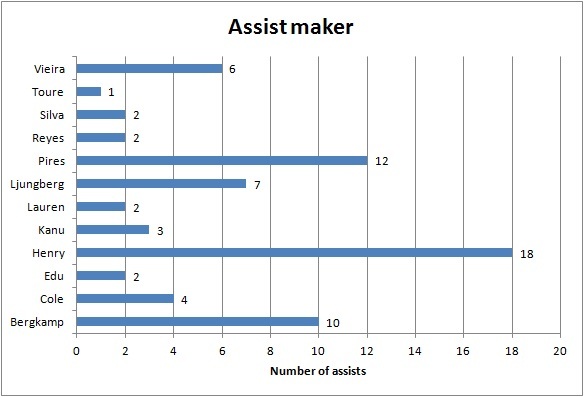 They were the top 2 most efficient assist makers in the team and Pires dropped to third. In short, Henry focused on scoring goals and making assists. Bergkamp focused on involvement of build-up of goals and making assists. Henry played mostly at left flank and moved to central area to score goals. This argument was supported by two evidences by analysing where he scored goals and where he made assists. 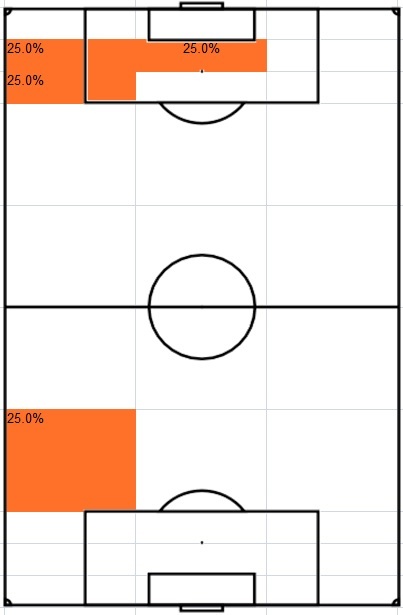 By considering open play goals, Henry scored 75% in central area (most inside penalty box) and 25% at left flank as shown in the following diagram. 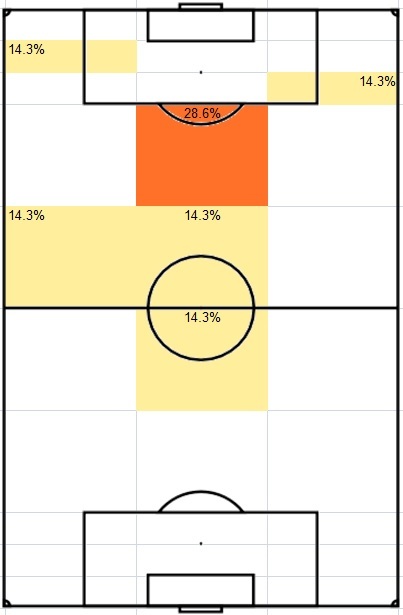 This evidence is not strong enough so we have to analyse where he made assists as well to see where he played mostly. Two results can be taken from this diagram. 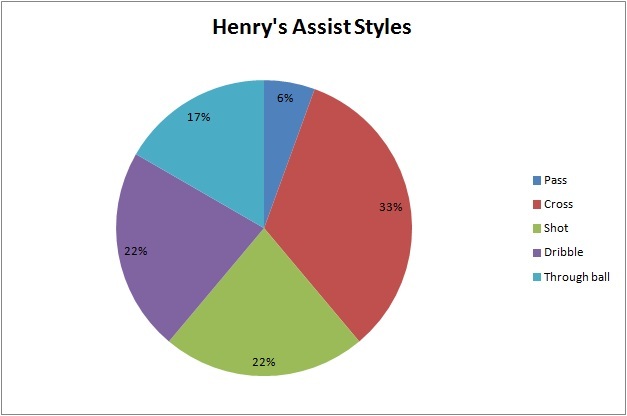 Firstly, Henry played mostly at left flank as he made 55.6% of assists on the left side comparing with 38.9% on the central area and 5.6% on the right side. 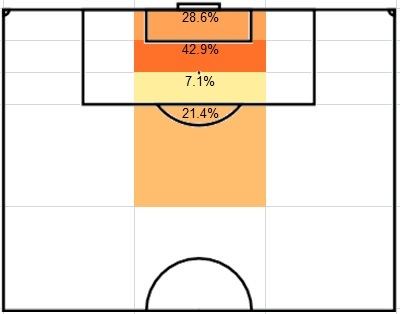 Secondly, if we focus on the left side, you will realise most of his assists were made in the final 18-yard of left side (44.4% of total) while he only made 11.2% assists outside the penalty area on left side. The reason of it will be explained later in this post. Therefore, we can conclude that Henry played mostly at left flank and then drifted to centre of penalty area to score goals. 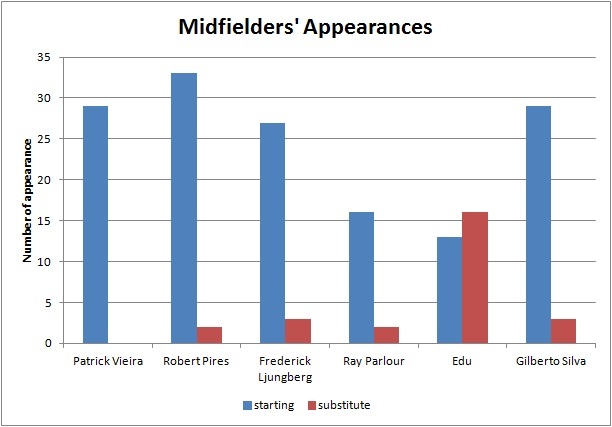 On the other hand, Bergkamp played more centrally than Henry and mostly spent his time outside the penalty area to provide support to teammates. 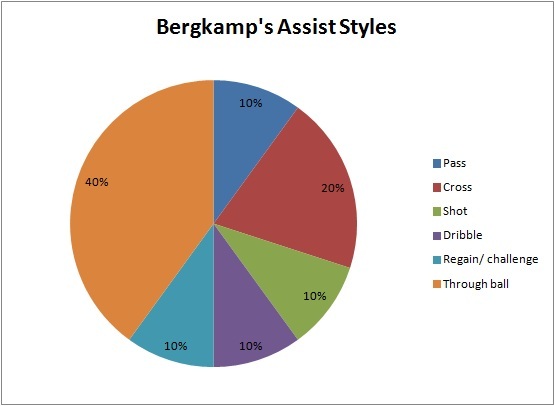 As shown in the following diagram, Bergkamp made 70% of his assists outside the penalty area. 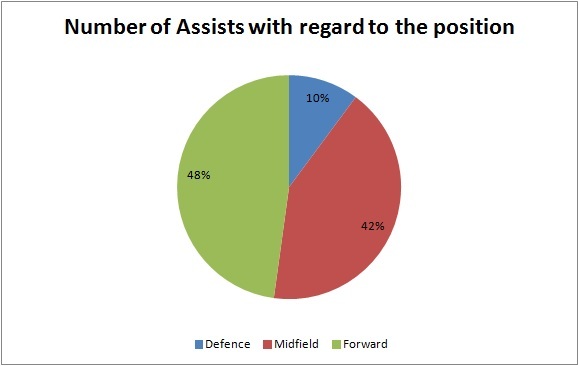 His percentage of assists in central area and right side was more than that of Henry. A comparative analysis could be made by making a table about where they made assists which shows their different playing areas. It supports my arguments above that Henry focused on playing left and scored in central penalty area while Bergkamp played more centrally and stayed outside penalty area in most of the time to provide support. This is a video example showing their position. Even they both started on the left side, when the ball was moved to right side, Bergkamp tended to move to centre and Henry stayed at left flank until he moved to centre to score the goal in the penalty area. 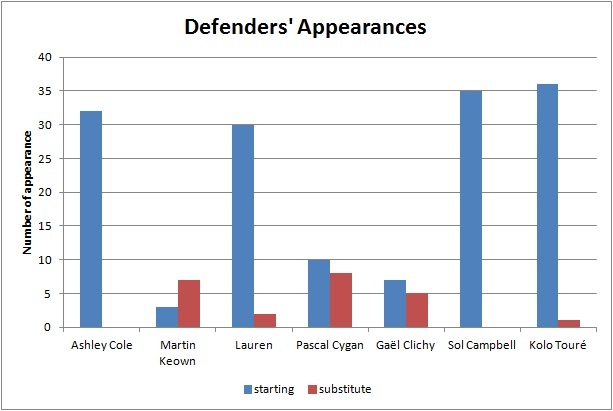 Henry was strong at attacking space behind the defence. 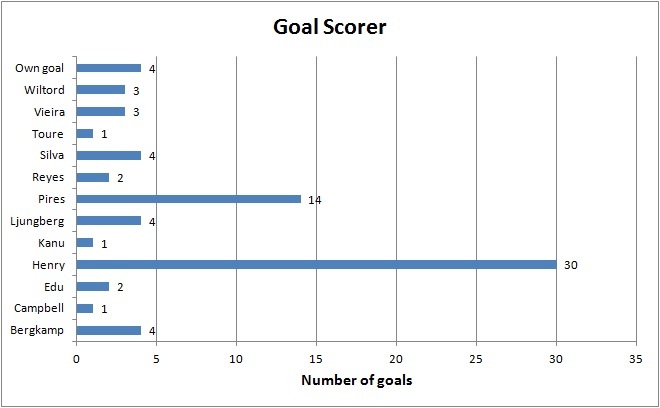 This could be analysed by looking at the assists styles of Henry’s goals. 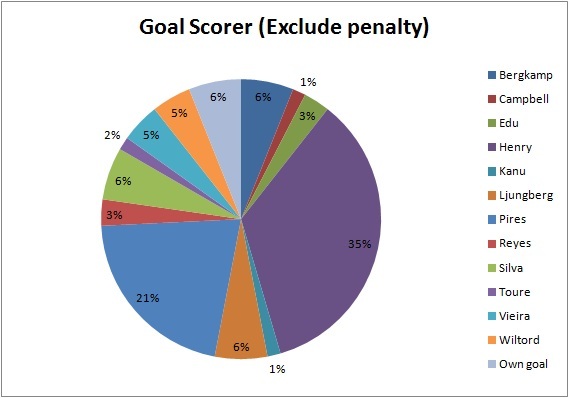 Note that the goals from penalty and direct free kick were excluded. 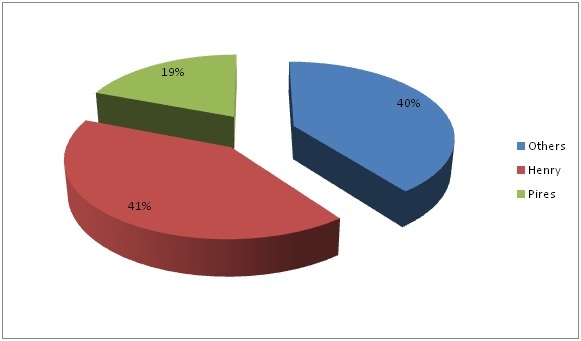 Three characteristics of Henry could be seen in this chart. Firstly, Henry was a striker who didn’t rely on crossing assist (15%). 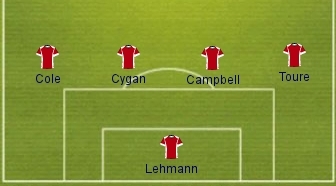 In a traditional 4-4-2 system, the strikers rely on the crossing from two wingers/wide midfielders but it was not the case in the invincible team. 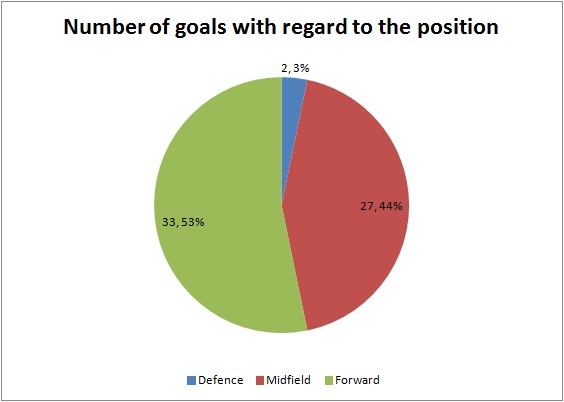 Secondly, he was good at exploiting space behind the defence because the largest proportion of his goals (30%) was come from through ball. It fits his styles as he was a fast runner. Thirdly, technically he was good because he could score goals by dribbling past his opponent (15%) and by receiving passes to his feet (20%). Even both players contributed well in terms of number and efficiency of making assist, their assist styles were different. This is supported by two evidences. Firstly, Henry was strong at crossing. 33% of his assists were made by crossing. 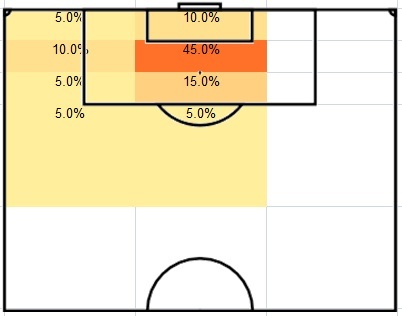 It can explain why 44.4% of his total assists were made in the final 18-yard area on the left side which is mentioned above. 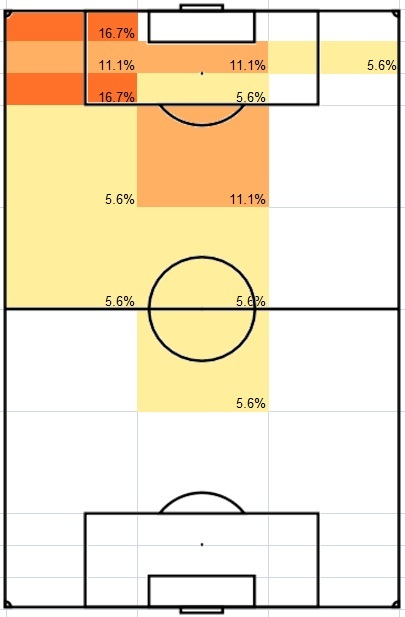 If you consider two evidences, 66.7% of his assists were made in final 18-yard area and 55.6% of his assists were on the left side, the final 18-yard area on the left side is the overlapped area which was Henry’s key playing area. Bergkamp was strong at providing through ball (penetrative pass to the back of defence). 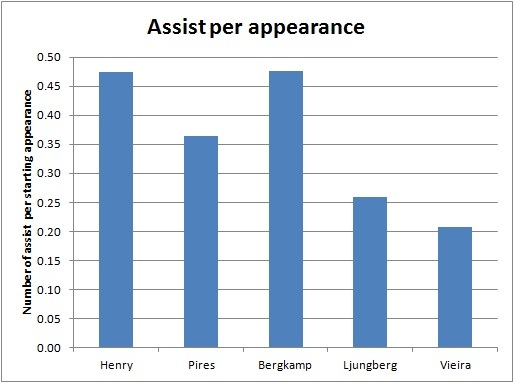 The result of Bergkamp’s assist styles is more obvious than that of Henry. 40% of his assists by made by through ball. It fits the previous finding that Bergkamp tended to play outside the penalty area providing support. 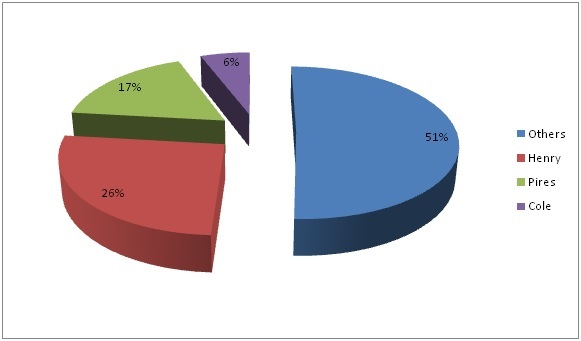 In conclusion, I would like to use a table to summarise my analysis. Their partnership was not a traditional 4-4-2 forward pair partnership. I argued that it was still an excellent partnership in Premier League’s history because they fitted in each other based on their strengths.